SECTION 1: Whenever the term "National Society" or "NSSAR" is used it shall mean the National Society of the Sons of the American Revolution. 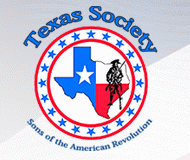 SECTION 2: Whenever the term "State Society" or "TXSSAR" is used it shall mean the Texas Society of the Sons of the American Revolution. SECTION 3: Whenever the term "Chapter" or "this Chapter" is used it shall mean the Bernardo de Galvez # 1 of the Texas Society, Sons of the American Revolution. SECTION 4: The Executive Committee of this Chapter shall consist of the Chapter President, Vice President, 2nd and 3rd Vice President, Secretary, Treasurer, Registrar, Parliamentarian and the immediate Past President. SECTION 1; The President shall preside at all Chapter Meetings and Meetings of the Executive Committee, and shall appoint Standing Committees and Special Committees as directed by the membership. The President shall advise the Chapter membership, or direct the Secretary to advise the Chapter membership, of all actions and decisions of the Executive Committee. The President shall represent the Executive Committee in all transactions. SECTION 2: The Vice-President shall act as President whenever the President is absent or unable to act for any reason. The Vice President shall act on other matters only if these matters cannot reasonably await the return or the renewed ability of the President to act. SECTION 4: The Treasurer is responsible for collecting, safe keeping, depositing, and disbursing all Chapter funds. The Chapter funds shall be promptly deposited in safe and solvent bank accounts as authorized by the Executive Committee and all accounts shall be in the name of the Chapter. Funds not exceeding $500.00 may be withdrawn on checks signed by either the President or Treasurer. Funds exceeding $500.00 will require two (2) signatures and may be signed by any two (2) authorized Executive Board members. Any meal expenses which may exceed $500.00 will not require two signatures. The Treasurer shall be responsible for collecting the cost of the monthly meals and for reimbursing the serving restaurant. The Treasurer will insure all guests and members sign the roster when paying for their meal. During the year the treasurer shall provide any reports requested by the President or the Executive Committee in addition to the detailed written report required at the Annual Meeting. The Annual Report shall show all monies and property of the Chapter, what has been received, and the manner of disposition. SECTION 5: The Registrar shall assist membership applicants with the filing process by reviewing their paperwork to insure that it conforms to NSSAR requirements. This review is essential before forwarding the application to the State Registrar, where it will again be reviewed, and checked prior to being forwarded to NSSAR. SECTION 6: Although not an elected officer the Immediate Past President is a valuable asset to the incoming President. The Immediate Past President is the person most familiar with the resources, forms, events and individuals that are important to the success of the Chapter. As a member of the Executive Committee, the knowledge and experience of the Immediate Past President will be an integral part of the Chapter planning process. SECTION 7: Additional elected Officers may include Second Vice President, Third 3rd Vice President, Sergeant-at-Arms and Webmaster, Historian, Chancellor, Chaplain, Color Guard Commander, Parliamentarian. Other Officers who may be appointed shall include Genealogist, Membership Chair, C.A.R. Liaison, and DAR Liaison. SECTION 8: Vacancies in elected offices shall be filled immediately for the unexpired term by election by the membership or if deemed an urgent necessity by the Executive Committee the Executive Committee may appoint a temporary officer holder until an election can be held. SECTION 1: Election of Officers shall be at the meeting immediately preceding the Annual meeting. SECTION 2: The terms of all officers shall be for one (1) calendar year. The President and Vice President shall not hold office for more than two (2) full consecutive terms. SECTION 3: Any candidate for office of this Chapter who has agreed to serve shall be nominated by the Executive Committee and their names shall be presented to the membership no less than seventy-two (72) hours prior to be placed in nomination. Additional nominations from the floor shall be accepted provided the candidate has agreed to serve prior to be nominated. SECTION 4: When there is only one (1) candidate for an office, the presiding officer may call for a vote in any manner recognized by parliamentary law. If there are more than two (2) candidates for the office and no one candidate receives a majority of the votes cast, all candidates shall be dropped except the two (2) receiving the highest number of votes. The voting shall then be between those two (2) candidates. SECTION 5: The Executive Committee shall use Chapter funds to purchase the Ceremonial Badge /or Official Neck Ribbon of the Sons of America Revolution as prescribed by the National Society in sufficient time to present the Badge or Neck Ribbon to the newly elected President upon his installation. SECTION 1: There shall be no less than three (3) Executive Meetings each year in addition to the Annual Meeting, which shall be the last meeting of the calendar year, or as soon thereafter as possible. There may also be additional meetings called by the President or the Executive Committee, or upon the written request of at least seven (7) members in good standing. SECTION 2: The Chapter President and members of the Executive Committee shall determine that meeting place and make all necessary arrangements for the meeting. SECTION 3: The order of business at all Chapter meetings except the Annual Meeting follows. SECTION 4: The nomination and election of Incoming Officers shall take place a the meeting immediately preceding the Annual Meeting. The installation of Incoming Officers shall take place immediately following the opening of the Annual Meeting. SECTION 1: Before requesting the required approval of the State and National Societies, any person desiring to become a member of this Society and this Chapter shall obtain the recommendation of two (2) members in good standing of this Chapter. All membership applications shall be submitted to the Chapter Registrar for forwarding to the State Registrar. SECTION 2: Any person desiring to transfer membership to this Chapter from another nationally approved Chapter, or desiring dual membership with this and another nationally approved Chapter shall secure the approval of the Executive Committee of this Chapter and the Secretary/ Treasurer of the State Society. SECTION 3: Before becoming a member of this Chapter the person desiring membership shall pay all required dues and charges of the National and State Societies. SECTON 4: New members of this Chapter may be inducted at any meeting of this Chapter, and the ritual prescribed by the National Society shall be followed as closely as possible. SECTION 5: The Executive Committee shall have the authority to hold a hearing to discipline or expel from membership any member of this Chapter. At any such hearing to discipline or expel a member of this Chapter, the accused may be present if he desires and shall be entitled to counsel of his choice at his expense. The accusers and the accused shall be entitled to introduce evidence bearing upon such accusation(s). In the event of an appeal by the accused, a transcript of the evidence shall be prepared in writing at the cost of the accused. Such transcript of the evidence shall, upon the request of the accused or the Executive Committee, be forwarded by the President of this Chapter, unless he be the accused, and in that event by the presiding officer, to the next higher authority. SECTION 1: Standing committees will be: ROTC/ Boy Scout Awards, Flag Certificates- North Flag Certificates- South Flag Certificates, Achievement Awards, Public Service Awards-North Public Service Awards South Veterans Awards and Service, Memorial Day, Fourth of July Parade, Dickens on the Strand Parade,. Contest Committee Oration/Picture Student and Faculty. SECTION 2: The chairman of all committees shall be appointed by the President and serve at his discretion. The Chairman shall appoint members of the committees subject to the approval of the President. Committee chairman shall keep a record of all work expenditures if so authorized by the Executive Committee and shall inform the President of all meetings and shall file a written report prior to each monthly meeting. Safekeeping of Chapter property, including but not limited to the framed 1986 Charter, the President's gavel, and the National, State, and Society flags, shall be the responsibility of the Chapter President and shall be protected by from loss or damage. The properties shall be passed on to the succeeding President following his installation. These By-Laws may be replaced by new, amended, or changed By-Laws at the Annual Meeting of the Chapter or at a special meeting called for that purpose. The proposed By-Laws, new, amended, or changed shall be read in a final form at the meeting or submitted to the membership prior to the meeting. It shall then be placed on file not less than one (1) hour prior to any final vote. Any changes approved by the meeting shall be incorporated therein upon final adoption. A two-thirds vote by those present shall be required for adoption. The rules contained in the current edition of Robert's Rules of Order Newly Revised shall govern this organization in all cases in which they are applicable and which they are not inconsistent with these by-laws and any special rules this organization may adopt. These By-Laws shall be effective immediately upon adoption and such adoption shall be noted in the meeting minutes. The remainder of the meeting by which these By-Laws are adopted shall be governed accordingly.